A paper on a new alien species recorded in the Aegean Sea and Hellenic waters, which is part of the ESENIAS region, has been published in Acta Adriatica, by G. Kondylatos, M. Corsini-Foka, G. Apostolopoulos and A. Zenetos. Synchiropus sechellensis Regan, 1908, is a tropical demersal species recorded from depths down to 91 m. It occurs over sandy or muddy substrata, among weeds and in coral reefs from tide pools and the surf zone. Described from Seychelles, its natural dispersion denotes a large gap as it includes the Indo-West Pacific from the Red Sea to Gulf of Aden, Maldives and eastwards the Chesterfield Islands and New Caledonia. The species was first reported in the Mediterranean Sea by GÖKOĞLU et al. 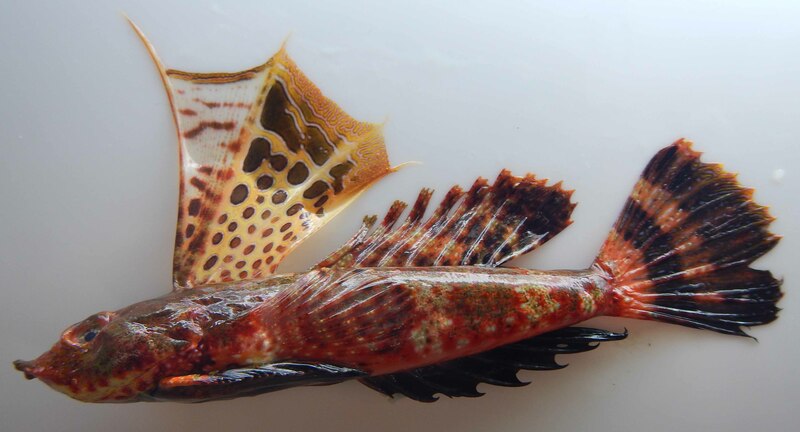 (2014), from Antalya Gulf, Turkey, collected by bottom trawl operation at a depth of 30-50 m, in April 2014. S. sechellensis was discovered in Kastellorizo Island (Levantine Sea, Greece) in September 2014, few months after its first record in Antalya Gulf, Turkey. Later, in February 2016, the species was recorded for the first time in the Aegean Sea, in Rhodes Island. The short time interval between the findings indicates a possible establishment in the area and a dynamic spread of the species northwards in the Eastern Mediterranean. GÖKOĞLU M., Y. ÖZVAROL R. FRICKE 2014. Synchiropus sechellensis Regan, 1908 (Teleostei: Callionymidae), a new Lessepsian migrant in the Mediterranean Sea. Mediterranean Marine Science, 15 (2): 440-442.